it's really easy to make these fantastic finger puppets. just follow the simple instructions and very soon you'll be acting out the story of the gruffalo yourself! 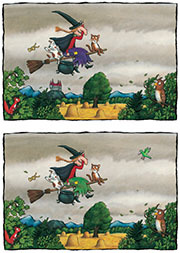 the witch and her cat are flying over forests, but can you find the ten differences between these pictures? george the giant needs your help! george the giant has lost his shirt and tie! can you show george which path to take to find them? colour in the picture of charlie cook reading is favourite book. the little old lady needs your help. can you match up the words that rhyme by drawing lines between them? who is this creature with terrible claws and terrible teeth in his terrible jaws? join the dots to find out, then colour in the picture. can you sign some of the words in the monkey puzzle story? the little snail wants to go on an amazing journey with the enormous whale. can you help the snail find the whale? do you want to look like the gruffalo? make your very own gruffalo mask and and soon you'll be walking in the deep dark wood.